I just finished reading the second book in Suzanne Collins Hunger Games triology, Catching Fire. As Katniss is getting ready to enter the arena for the second time, her mentor reminds her, You remember who the enemy is. It was a reminder as to who was the real enemy, not who she was being led to believe were her enemies. Therein is the issue for us today. Who is the real enemy? Let’s look at a couple of recent incidents. You be the judge. The ad’s creator, Pam Geller, defended the controversial ad as freedom of speech. Is the enemy jihad? AFDI would like us to think so, but I don’t think jihad is the real enemy. As misunderstood and overused as jihad is, the inflammatory language used in this ad is both offensive and completely inappropriate. I believe in free speech and AFDI does have the right to say these words. However, if we want to retain out rights, we must be responsible in our exercise of those rights. Rights are slowly or violently withdrawn when people fail to act responsibly. The enemy here is bigotry. There will always be people who think and believe differently than ourselves. And that’s a good thing. But, even if we don’t like it, as people of faith we are stilled called to love others. Period. Purposely choosing inflammatory and hateful language is wrong. Hateful language will only elicit the self-fulfilling aspects of inflaming and inviting violence. There is nothing civilized about violence. California’s Ban on Cure Therapy: California is the first state to ban therapy aimed at “curing” minors of homosexuality. As you can imagine, there are groups already challenging the law that is to go into effect January 1, 2013. So why do we even need a law like this in the first place? If we honestly answer that question, we might actually discover the real enemy. Sadly, we must have laws to protect those who are vulnerable. If, as a society, we were concerned for the vulnerable, oppressed, and forgotten, we wouldn’t need laws reminding us. We have the Voting Rights Act, for example, because states had discriminatory voting practices. Minors fall into the vulnerable category. There was a time when all mental illness or “abnormal” behavior was treated with electric shock treatment. Except for extremely rare situations, that form of treatment was far more harmful with no benefits for the patient. Even after most professionals deemed electric shock treatment anti-theraputic, some patients continued to be subjected to this outdated mode of therapy. Homosexuality is not the enemy. Law-enforcing government is not the enemy. The real enemy is denying a child the opportunity to discover all they are created to be. As any parent knows, your children are not extensions of you. They are their own unique, independent beings who will develop their own personalities, interests, and lifestyles. You may not like it or the path they chose to get where they are going. Your role is to provide love and support and guidance. The rest is ultimately up to them. Before you jump into the arena of popular opinion demonizing the next issue, ask yourself: Who, or what, is the real enemy? 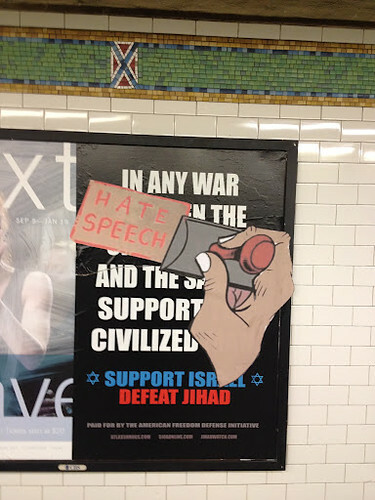 Photo: Shortly after this ad was posted in NYC subway stations, graffiti artists began altering them. Next PostNext Which Side of The Line Are You?